I received an email on 2017-02-27 promoting the March For Science. It appears that the Trump administration has removed terabytes of data from open.whitehouse.gov http://open.whitehouse.gov/ replacing it with Trump administration news and press releases. While it says “Check back soon for new data” the removal of this data would be significant set back in science and computing. This situation is well worth monitoring. 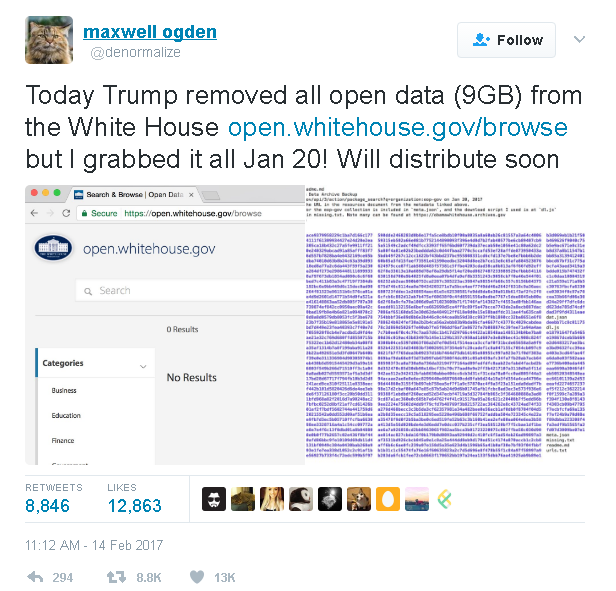 Did terabytes of data get removed from open.whitehouse.gov in January or February 2017? If so, why, and is there any mirror/backup of it somewhere else? I'm not sure about "terabytes" but yes, the new administration has edited the whitehouse.gov domain, including the open subdomain. New administrations across all levels of (U.S.) government, particularly around elected officials, wipe domains and start a new. While there are many things going on currently with the Trump administration that are bad for open data/open gov, this is nothing new, nor inherently alarming. Yes, the Obama administrations entire whitehouse.gov presence is currently hosted at obamawhitehouse.archives.gov/ including the open subdomain. Furthermore, Max Ogden tweeted out that he had archived the entire subdomain, though I'm not aware of where/if it is online yet. You can also look/view/track on the Wayback Machine; I recommend doing this for some clarity around how often this occurs. I'm most familiar with virginia.gov which gets wiped with every new administration; its a great example because Virginia doesn't allow for back-to-back governors, so every four years we have a new site. Not the answer you're looking for? Browse other questions tagged usa politics or ask your own question. Where to get data list of Corporate Meeting Planners?